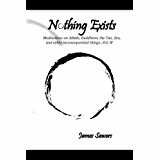 Description: Nothing Exists, is the fourth volume in the Nothing series. It is similar to its companion volumes, Nothing Works, Nothing Special, and, Nothing Matters, in that it is a book of personal examination and exploration, the outcome of which is a collection of poems that blends personal tales of discovery and direct experience, with more distant and imagined poems in Aikido, meditation, and eastern thought in general. The author’s first hand, direct experience comes across in his writings.